Gelatine is an indispensable all-rounder that is used in countless products and applications. Most people only associate gelatine with desserts and fruit gums. However, gelatine also plays an important role in various technical applications. Collagen peptides as well are used for an extensive range of products and applications. Through its diverse properties and functionalities, final consumers reap benefits that were unimaginable many years ago. Not only the food, pharmaceutical and photographic industries fall back on gelatine for its healthy and stabilising effects. A large number of other industrial branches benefit from the positive properties of this natural product. The following examples demonstrate the wide spectrum of possible applications. Stem cells are cultivated on special surfaces and implanted together with these into the human body. Materials such as latex, styrofoam or even glass particles are often used as carriers, since stem cells can “hold on” well to them. However, these materials may lead to undesired side effects because the human body cannot break them down biologically. A gelatine carrier is a gentle alternative, because it is an entirely natural product. Gelatine is very well tolerated by the body and can be broken down completely. Scientists at the Fraunhofer Institute for Interfacial Engineering and Biotechnology IGB in Stuttgart have developed biological inks made from gelatine that are suitable for 3D printing and that can be used to create artificial tissue. The biological inks remain in their liquid form during the printing process. However, when they are subsequently treated with UV light, they link together to form hydrogels that do not dissolve when heated or when placed in water. The scientists can control the chemical modification of the biomolecules in such a way that the resulting gels have varying degrees of solidity and swellability. This makes it possible to recreate the properties of natural tissues – from solid cartilage to soft fat tissues – and make custom-fit implants for crash victims, for example. Gelatine can be used to take an in-depth look at the growth and behaviour of bacterial communities. Scientists at the University of Texas at Austin, USA, have developed gelatine cages for germs using a laser-supported procedure. Conditions in these cages can be precisely controlled, making it possible to study the development of antibiotic resistance or therapies for infections, as researcher Jodi Connell and her colleagues wrote in the scientific journal Proceedings of the National Academy of Sciences (PNAS). A student at Brunel University in Great Britain has developed a so-called “Bump Mark” composed of gelatine. It can be used to replace or at least supplement the labels widely used to indicate the best-before date of perishables. The mark is filled with gelatine and contains little bumps. As long as the gelatine remains solid, the bumps cannot be felt. However, as the food approaches its date of expiration, the gelatine begins to decay and becomes fluid, which means that consumers can clearly feel the bumps with their fingers. Gelatine is a protein and “ages” in a manner similar to milk, meat or cheese, especially since the label is exposed to the same conditions as the contents of the package. The different shelf lives of the various foods can be taken into account by varying the amount of gelatine in the label: the more gelatine the label contains, the longer it will remain in a solid state and cover the bumps. For all consumers, but especially for those with visual impairments, the “Bump Mark” could be a huge help because it dispenses with the tedious process of deciphering best-before dates. In addition, it could do away with the uncertainty many consumers feel when dealing with best-before dates: especially in Western countries, consumers throw out large amounts of perfectly good food, simply because it has passed its expiration date. A team of Swiss scientists, led by Wendelin Stark and Philipp Stoessel, have invented a way to create a wool-like fiber using leftover parts from meat-processing plants. The technique transforms animal-rendered gelatin into fibers that share many of wool’s qualities, including softness and thermal insulation. According to Stoessel, all those little bits that don’t make it onto the dinner plate are dissolved in water, precipitated with an organic solvent, and then extruded. The material is then ejected through the syringe and allowed to harden into a gelatin form. Those strands are stretched and dried on a proprietary machine and within a few hours are ready to be spun into balls of yarn. The new wool is created with materials that would otherwise go to waste. It also has a significantly smaller carbon footprint than some synthetic, petroleum-based alternatives. Gelatine improves our enjoyment of beverages. It makes the production of clear wines, juices, ciders, and in some countries even beers possible. Wine is expected to be clear and free of visible foreign substances or haze particles. However, at the end of its fermentation process, wine is opaque and not the nice golden yellow or ruby red consumers would like it to be. This brew therefore undergoes a special treatment called fining or clarifying. Specially processed edible gelatine is an effective processing aid for clarifying wines. The gelatine binds with the tannins of the wine to form insoluble flakes, enclosing the haze particles and precipitating them out of the wine. These can then easily be removed prior to bottling. Gelatine acts just as an aid (processing aid) to get rid of the fine particles and turbid materials, it is not an additive. Specially selected gelatines and collagen peptides are widely used as plant fertilisers. The nitrogen content is precisely dosed through the gradual breakdown of amino acids. Thus, gelatine has a positive effect on the metabolic mechanisms of plants. Gelatine has been one of the most important adhesives since the Stone Age. Glutin, one of the main constituents of gelatine, is the source of its adhesive strength. Glutin has given its name to an entire group of animal glues that can be moulded when heated and set and bind as they cool. Even today, special gelatine is still used in the preservation of historical monuments as a historic binding agent for distempers and as a binding agent for paints. The adhesive strength of good gelatine can equal up to 1.6 tons per square centimetre. Gelatine is still being used today in the construction of musical instruments, e.g. for high-end violins, and to glue together the wooden components of high-quality furniture. In contrast to synthetic adhesives, a glue made with gelatine can effortlessly be loosened at any time by applying heat and moisture, all without doing any damage to the workpieces. Synthetic adhesives remain hard after setting, which can lead to damage to musical instruments or pieces of furniture. Improper handling of asbestos material can pollute the air that one breathes with millions of carcinogens. When renovating buildings that have been contaminated with asbestos, the polluted surfaces are sprayed with a gelatine solution. This creates an elastic network that binds the asbestos fibres, which ensures that no asbestos escapes during its removal. When gelatine is used as a binding agent, the bound asbestos mixture can subsequently be mixed with cement. The resulting block is so hard that the asbestos fibres remain permanently bound and can thus be disposed of in accordance with the regulations. Zinc and cadmium can be cleaned by adding gelatine to electrolytic baths. Gelatine makes it possible to separate contaminants from the materials, thus forming the basis for the manufacture of metals of high purity. Stem cell therapy is carried out for a number of diseases to remove pathogens and thus aid in patient recovery. During this process, stem cells are cultivated on special surfaces and implanted together with this material into the human body. Carriers such as latex, Styrofoam and even glass particles are often used since the stem cells can “hold on” to these materials well. However, since the human body cannot biologically degrade these materials, this can lead to undesirable side effects. Using gelatine as a carrier material is a gentle alternative since it is a pure, natural product. It is very well tolerated and can be completely broken down by the body. Scientists at the Fraunhofer Institute for Interfacial Engineering and Biotechnology IGB in Stuttgart have developed gelatine-based biological inks that are suitable for 3D printing and that can be used to create artificial tissue. The biological inks remain in their liquid form during the printing process. However, when they are subsequently treated with UV light, they link together to form hydrogels that neither dissolve when heated nor when placed in water. The scientists can control the chemical modification of the biomolecules in such a way that the resulting gels have varying degrees of solidity and swellability. This makes it possible to recreate the properties of natural tissues – from solid cartilage to soft fat tissue. Thus, for example, implants can be made to fit accident victims precisely. Gelatine can also be used for an in-depth examination of the growth and behaviour of bacterial communities. Scientists at the University of Texas at Austin, USA, have developed gelatine cages for germs using a laser-supported procedure. Conditions in these cages can be precisely controlled, making it possible to study the development of antibiotic resistance or therapies for infections, as Jodi Connell and her team of scientists wrote in the scientific journal Proceedings of the National Academy of Sciences (PNAS). Thanks to its stability as well as its elastic binding properties, gelatine is ideal for restoring or fortifying crumbling stucco ceilings. 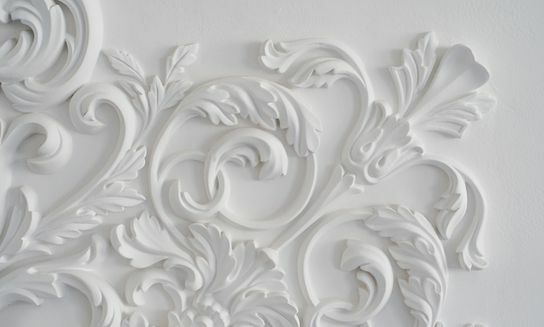 Thus, plasterers use it to treat ornate plasterwork surfaces. Using a natural hair brush, warm, viscous gelatine is applied to the stucco marble surface between several sanding treatments and then processed. This treatment is called “fine filling”. When entire pieces have to be recreated, the gelatine is directly mixed into the marble. This ensures that it does not harden as quickly, making it easier to work with. Once the stucco marble has dried, it becomes as hard as a rock and will hold for the next centuries. This is also true for ceiling frescoes: in the Sistine Chapel in Rome, the gelatine paste used by conservators keeps Michelangelo’s paints looking radiant. Gelatine is also used in the field of book restoration. This is because its adhesive strength and elasticity can easily be regulated. It can also be removed again with little effort and does not leave a residue, which is especially important for paper restoration. Paper has only been made from wood since the mid-19th century. The acid wood glue applied back then is now leading valuable folios in archives and libraries to become brittle and fall apart. Gelatine is used here as a “natural adhesive” to mend cracks or re-glue. However, gelatine also fulfils another purpose: it can reinforce paper or parchment. Conservators split damaged pages into front and back pages and then reinforce them with a wafer-thin sheet of special paper. During this process, the manuscripts are first pasted to a carrier paper, from which they are “torn off” again later. Gelatine is used as an adhesive, and its reversibility makes it possible to later remove the carrier paper from the manuscript. Gelatine can also set the colours and the writing of an historical text and arrest what is known as acid ink corrosion. In this process, chemicals affect and dissolve the ink on the paper. Decay is very rapid when water is added to the mix. Gelatine can stop this process. For example, gelatine made it possible to restore the valuable original music scores that were damaged during the flooding disaster in Dresden in the summer of 2002. Criminalists also fall back on gelatine when working on murder cases. They use it to solve crimes in cases when neither casings nor bullets, let alone a weapon can be found at the crime scene. A special block of gelatine can determine which weapon or ammunition was used. This block, called “ballistic gelatine”, is quite similar in density and in its properties to the tissues of the human body. In order to better be able to analyse the pattern of injury, artificial bones and veins can also be embedded into the block of gelatine. Wound ballistics specialists shoot into the block of gelatine from varying distances and angles and with various weapons. They then calculate the bullet channels and the kinetic energy. These findings are compared with the victim’s wounds, which makes it possible for them to determine which weapon was probably used. The transparency of gelatine makes it especially easy to understand projectile behaviour. It also enables specialists to film or photograph the behaviour of the projectile using a highspeed camera. This type of information is also useful for military surgeons. Understanding the ballistic behaviour of a projectile within the body makes it possible for them to make a more precise diagnosis. When faced with a number of patients with shot wounds, they can more quickly determine who needs treatment first. The most well-known forensic method that involves gelatine is fingerprint recovery. The search for prints is carried out by dusting objects with a brush and powder. The powder adheres to the sweat and fat that make up the prints. Photographs are made to collect the evidence. The print is then lifted onto the gelatine coating of a special film and the film is transferred onto a document. Similar gelatine-containing films are used to lift glove, shoe, or footprints as well as tyre tracks, dust prints and micro-trace evidence. Gaping flesh wounds, burnt skin, disfigured faces: gelatine often plays a part in creating that which can lead unsuspecting home owners to shudder in horror when they open their doors on Halloween and regularly fills fans of horror and action movies with fear. Gelatine has long been used by make-up artists to portray all types of wounds and skin changes. And despite it being the era of computer animation, Hollywood is using the substance nightmares or dreams are made of in its film and television productions – and not only for masks. Quite a few of the “organs” seen on the dissecting tables of forensic investigators in TV series are made of dyed gelatine. What is known as “special effects” gelatine can also be used to cover inconvenient hair growth and eyebrows as well as to create tonsures in real hair. The benefits of this material are obvious: gelatine is a flexible and inexpensive material that is easy to work with and dye. In contrast to other materials such as latex, gelatine has been found to elicit few or no allergies, even after direct skin contact. These are just a few reasons why Halloween fans like to use gelatine to create their own individual disguises on the “night of the ghosts”. Synchronised swimming is not about achieving fast times. Instead, it is all about elegance. Which is why the make-up artist is the first stop before any competition. More than anything else, the hairdo must stay in place. However, there are not a lot of styles to choose from. The chignon is a must. For those with thin or short hair, an artificial hairpiece can help. Liquid gelatine is then applied to the hair. It hardens as it dries and keeps every strand of hair in place. People are most familiar with gelatine thanks to the all-popular jelly bears. But in laundry detergents? Laundry detergents and cleaning agents need to meet contradictory requirements in terms of how they are delivered to the consumer. On the one hand, laundry detergents and cleaning agents should be in as concentrated a form as possible to save packaging materials and energy costs. On the other hand, the more concentrated the laundry detergent or cleaning agent, the more difficult it is to properly handle and measure out. Not only too little, but also too much of a product will lead to unsatisfactory results, especially in the case of highly concentrated laundry detergents. These problems are solved by encapsulating the laundry detergent or cleaning agent. Water-soluble polymers such as gelatine make encapsulation possible. The capsule shells dissolve and break down when they come into contact with water during the washing process, at which point the precisely measured dose contained within the capsule is released into the washer drum. A further advantage: gelatine manages to reduce the visible greying of laundry. At around 40°C, surfactants change gelatine’s structure and it encloses the emulsified dirt, leading to less grey discolouration of textiles through washing and less renewed uptake of previously removed dirt by the fabric.